I often say that I am tired, stressed or my head feels 'cloudy'. I put a hell of a lot of pressure on myself along with a hefty workload that I often don't say that I am struggling and need to say no to things. We all need a break sometimes, even if it is just for 30 mins a day just to take some time out. Breaks are good for you and your soul. I understand the importance of taking a break most suffering with migraines and anxiety on a daily basis. I thought I would share some things you can do for half hour which help keep me calm on those kind of days. Maybe there'll be something that you haven't done in a while and it inspires you, who knows! I hope you'll be spending some time today switching on that phone and having some time to calm. If you haven't enjoyed the pleasure of a Lush bathbomb then treat yourself to one, TODAY. Stick on your kettle and curl up with your current read or something of your favourite book, you'll find that this activity can go on longer than 30 minutes,,, that's ok! I really enjoy reading Harry Potter and couldn't recommend Reasons To Stay Alive by Matt Haig enough, it's such a good read! Stick your coat and shoes on and go for a walk around where you live, you may even have a night walking spot you can go and wonder within. I even take my camera with me sometimes, get some of those blog pictures for a future blog post because you can work and relax too right? I really enjoy going for a walk with a friend too, it gives you time to have a good natter too! Tidy house, tidy mind right? I feel tons calmer when I've cleaned one space in my house. Stick on those favourite tunes of yours too, because it makes for good company and motivation. I always like to pop to the shop and treat myself to a bunch of flowers too, it makes a room feel so much calmer and comforting. Find a space in your house, whack up the levels on your favourite album and do some dancing! It doesn't have to be choreographed, it's proven research that dance helps reduce stress levels. This usually ends up in me choreographing my next routine for future work too! We often grow up and find it near impossible to keep in touch with friends, why not pick up your phone and text somebody you haven't spoken to a while. Get their latest news, arrange a meet up or just talk about the latest episode of TV series you've been loving! I love Spotify so spend the majority of my downtime finding a playlist to suit my mood. It's also really fun creating playlists from these downtimes for future reference! That was short and simple, I hope you enjoyed this post and it's given you some ideas! 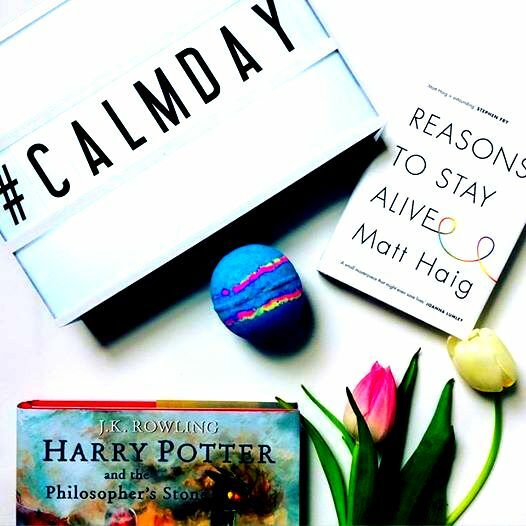 How will you be spending your #calmday? Aha glad you love the dancing around (it's a favourite in the comments!) I'm often dancing to Justin Bieber or reacting a musical song to my heart's content! A great list of tips! I'm exactly the same. I'm currently reading the Matt Haig book, and loving it! Dancing's a great one. Nothing better than going wild dancing (even though I can't dance at all). It's so important to give yourself a break, even from blogging for me. I've let my mental health state get far too low before and I'm not letting it happen again haha. Yeah definitely, I find it harder to at the moment as I'm balancing two jobs! Bring on next Thursday and i'll only have one job so all my focus can be elsewhere and I can enjoy blogging/relaxing again. Yeah walks are great, especially whilst the weather improves! Really great post and very important too! Baths used to be a huge thing for me but the house I'm in now doesn't have one :( boo!! But I have one if I go to my parents haha. Cleaning and organizing is probably my top one though. Thanks for stopping by and yes definitely important to acknowledge and talk about :) Oh no! I couldn't imagine my house without a bath, it's perfect for those days when they've been long and crappy! I really enjoyed this post, made me happy reading it to be honest because I was thinking about how much I should practice these tips for myself, thank you.